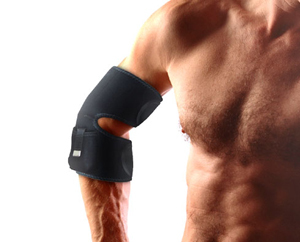 .Heated Elbow - Keep your elbow warm. 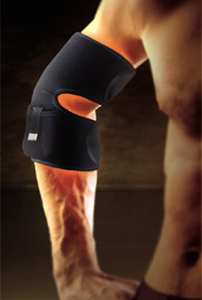 Perfect for relieving the pain of arthritis and joint stiffness. - The major heating function provided by pioneer non-metallic “ ThermalTek®”fiber wire. - Battery charger + Battery Car Charger included. 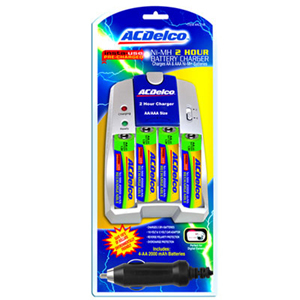 - Rechargeable battery NiMH AA x 4 included. - Size M : 400 mm wrap length. - Size L : 425 mm wrap length. Tennis elbow is the most common cause of elbow pain and may occur while swimming, playing tennis, playing golf, lifting, throwing, doing carpentry, or even plumbing. Your elbow is painful when the soft tissues are hurt from repetitive activities and will take time to heal. That's why doctors recommend heat therapy to lessen the sensation of pain. We recommend you use the most reliable elbow wrap that delivers soothing heat and supports your elbows, the FIR thermalution heat Elbow Wrap. Our heat wrap not only provides the steady heat to relieve your pain, but also increases blood flow to your elbow to accelerate its healing. It's a wrap that actively aids you to recovery. 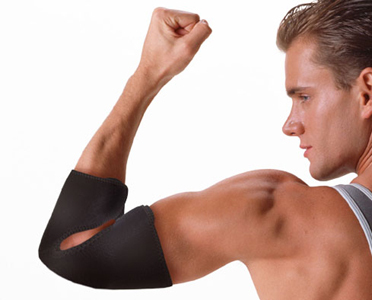 Get sure relief for your elbow. 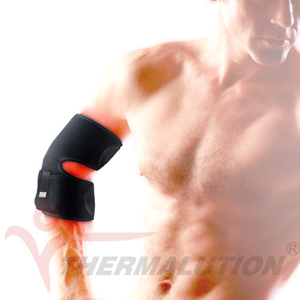 Get the Thermalution FIR heat Elbow Wrap. Far iInfrared ray (FIR) is a spectrum of natural sunlight with a wavelength of 4 – 1000 microns. It is invisible to the human eyes. The National Aeronautics and Space Administration (NASA) pointed out that FIR with wavelength between 6 – 14 microns is capable of penetrating deep into the human body where they gingerly elevate the body temperature and generate resonance. It can accelerate metabolism, improve circulation and provide warmth. Testing of Petatech® International Co., Ltd. products, performed by Chung-Shan Institute of Science and Technology, demonstrates that all of Petatech’s products generate the desired FIR with wavelength of between 6-14 microns. All goods generated by Petatech® are made with the same concept in mind: to bring warmth to the world. The entire Thermalution® crew is willing to dedicate their best products to each and every consumer and hope that their products can also give warmth to your heart. It consists of the most advanced functional fabric, up-to-date design and our ThermalTek® non-metallic Heating Wire Technology that generates heat and warms up the blood. It gives you the warmest clothing you will ever need in cold. Not only is it suitable for all kind of outdoor activities like hiking, fishing, skiing, hunting, riding etc., it's now also available for cold Water activities like surfing, diving, swimming and kayaking etc. Effective therapy and comfort in one product. Pain is a silent epidemic. In 2009, the Ohio State University Medical Center reported that 76.5 million Americans experience pain that lasts more than a day. Fifty million live with chronic pain and 25 million suffer from acute pain. This results to loss of productivity and decreased lifestyle. Pain may be caused by an accident, sports injury, ergonomics or work-related injuries or simply aging, a process all of us are going through. Chronic pain is something you CAN live without. It just comes down to making the right choices to enhance your quality of life. We're offering you our tried and tested product that's given satisfaction to thousands of our customers.